I love creating new dessert recipes, especially frozen desserts. This one is a combination of several favorites. I made it a few times before I was satisfied with the result. 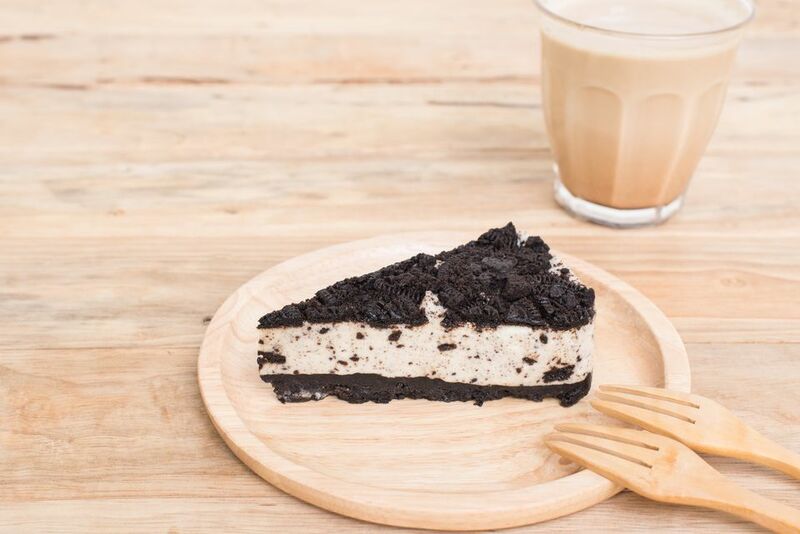 Black and White Frozen Dessert is one you will be proud to serve to company. It really reminded me of Black and White Cookies, thus the name. The filling is very simple and the whole thing is quite easy to make. The only tip is to make sure that the cream cheese is very well softened before you begin, and you should have an electric mixer (either stand or hand-held) to make the recipe. Beat the cream cheese mixture well to make sure it is completely smooth, so the dessert will have a velvety texture. This six ingredient recipe is also perfect for entertaining because it has to be made well ahead of time. It's easy to cut straight out of the freezer, too, since the filling isn't ice cream, but a rich frozen vanilla mousse. It also won't melt into a puddle like ice cream desserts will, but will keep its shape as your guests slowly enjoy it. You could serve it with more hot fudge topping, warmed and drizzled over the top, but that's really gilding the lily. Cut this dessert into fairly small squares to serve, as it is rich. It's the perfect finish to a meal of grilled steak, Fresh Corn Salad, a fruit salad, and some grilled breadsticks. Enjoy every bite. In large bowl, combine crushed cookies with melted butter until coated. Press 2/3 of this mixture into the bottom of a 13" x 9" glass baking dish and set aside. In medium bowl, combine cream with powdered sugar and vanilla until stiff peaks form. Place cream cheese in large bowl. Using the same beaters you used to beat the cream, beat the cream cheese until it is light and fluffy. Spoon the filling over the cookies in the pan. Cover and freeze for 1 hour. Then drizzle the hot fudge sauce over the filling and gently spread to make a thin and even layer. Sprinkle with remaining cookie crumb mixture. Cover and freeze for 4-5 hours until firm. Cut into squares to serve.